The Bees, begins with a father and son in Central America breaking into an experimental bee colony. The bees inside are horrifically dangerous and kill with a single sting. The bees escape and begin to more north towards the United States. The swarm seems unstoppable as it crashes planes, kills people and destroys the occasional parade. A couple of scientists have come up with a brilliant idea to stop the bees once and for all... make them gay. "They're just like regular bees... except you know, gayer." The Bees is the height of ridiculous. It combines the disaster film with a half thought out theft from the likes of super intelligent ant movie, Phase IV (1974). It manages to present silly moment after silly moment and while it plays most of it as serious, the movie can’t quite keep a straight face the entire time. It is less of an actual story and more of series of vignettes designed to keep the film running long enough to get to the next goofy set-piece. 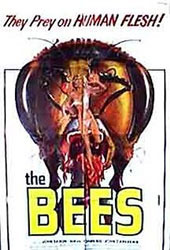 I think this all makes it a marked improvement over another infamous killer bee movie, The Swarm (1978), which is far too ponderous and leaden to be much fun at all. The cast are all surprisingly game for such a silly movie. John Saxon gives it his all as a slightly incompetent and more than slightly lecherous, scientist. Angel Tompkins is not a good actress, but she proves to have chemistry with Saxon and together they end up an interesting couple. 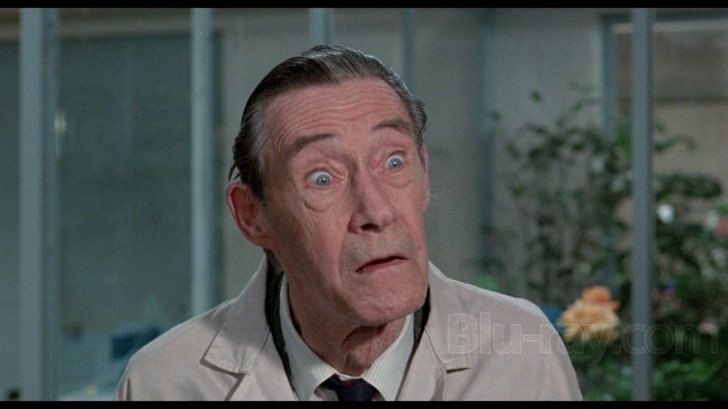 John Carradine steals the movie as Dr. Sigmund Hummel, complete with a screamingly fake German accent. It’s so phony I initially thought he was just putting it on as a laugh for the other characters, soon enough I learned it’s supposed to be his natural accent. "OK, I'm ready. Pull my finger." The special effects range between an indistinct cloud of dots that is supposed to be a swarm of bees to actors just getting bees dumped all over them. The bee sting effects are never gross enough to infringe on the silliness of it all. Since there really isn’t anywhere to go with bee stings, the filmmakers decide to go to the chaos route with car wrecks, running, screaming, and general mayhem any time the swarm attacks. The Bees isn’t a smart film, but it does provide a smart riposte to overly serious nature of both the disaster and eco-horror films of the time. Not only that, but it manages to be a fun romp that goes out with a weird finale. I didn’t expect much from this film, but it stung its way into my heart.